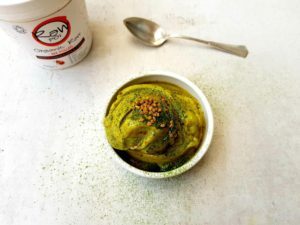 Frozen bananas, matcha green tea and sweet, little”sprinkle of nature”, raw bee pollen as main ingredients are all you need for this “nice cream” recipe. 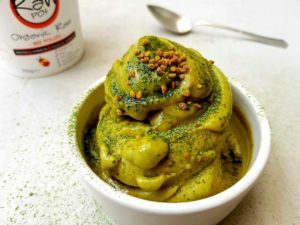 Easy to make, easy to digest, fresh, homemade, terribly delicious and simply packed with nutrients! Why ask for more? Cut bananas into little small pieces and freeze for at least 4 hours or overnight. Using a food processor, blend the bananas, matcha powder, raw bee pollen, vanilla until mashed.